It can be difficult to stick to a fitness plan, particularly when it comes to mealtimes. People often feel as though it’s more expensive to eat healthy, but this isn’t the case. I find that if you review your last 5 grocery receipts and add up the convenience items (boxed mixes, chips, snacks, yogurt, etc) versus the fresh fruits and vegetables, you’ll probably find you spent more on those items than you did the healthy alternatives. 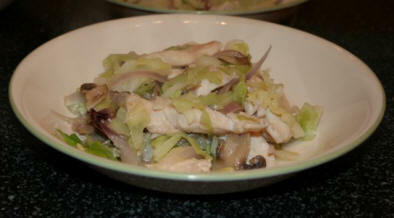 Here is an example of a frugal dish that will not only save you money, but is also a health conscious choice. 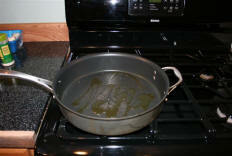 Heat 1 T. of olive oil in a large pan over medium/high heat. 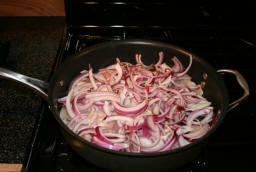 Add onions and saute until they are caramelized. 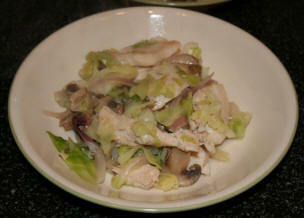 Add garlic and chicken, saute until chicken is no longer pink. 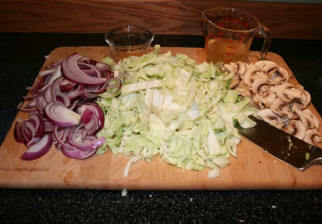 Add Mushrooms and cabbage, saute until the cabbage is soft. (Approximately 5 minutes). 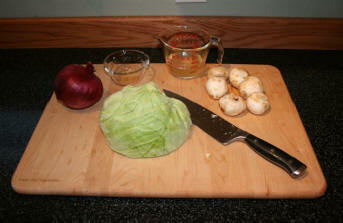 Add Chicken Broth, reduce heat to medium, cover and cook 5-7 minutes or until cabbage is good and tender. Remove the cover, turn the stove up to medium/high heat and saute, (stirring occasionally) until the the liquid evaporates, about 2 minutes. This particular recipe is a Favorite in this house, the kids absolutely LOVE it. :heart: It’s even better the next day heated up. For those that aren’t too keen on mushrooms, they can be omitted completely. If you have a really large family you can cook rice and serve it on the side, or don’t saute off the remaining liquid and instead serve the dish OVER a bed of hot rice.